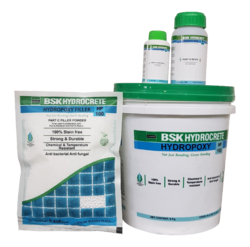 Pioneers in the industry, we offer bsk hydrocrete hp- 101 twinkle grout and hp100 hydropoxy epoxy grout from India. Twinkle Grout for Floor and Wall is an epoxy grout specifically designed to enhance aesthetics and performance. It is suitable for use with ceramic tiles, vitrified tiles, glass mosaic tiles, designer tiles, Agglomerates and natural stone.